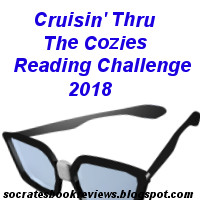 Welcome to the eighth annual Cruisin' thru the Cozies Reading Challenge! I'm changing things up again this year. Some readers enjoyed reading the sub-genres, others found it too difficult. So, this year, we’re going to have something for everyone. A) Read only cozy mysteries of your choice. A) Read 20 cozy mysteries of your choice. A) Read 30 cozy mysteries of your choice. 1. The challenge runs from January 1, 2018 and ends December 31, 2018. 2. You don't have to choose your books in advance. If you do, you can change your list at any time during the year. Books can overlap with other challenges. 3. Books can be in any format - paper, audio, ebooks...it all counts! 4. You don't have to post a review, but I'm sure others would love to know about the books you are reading and may even want to add it to their reading lists. NOTE: If you don't have a blog and want to participate, that's fine. You don't have to have a blog, just post in the comments section as you finish books. If you belong to a site like Goodreads and review the books there, that's fine too. Just leave us the link. I also have a group for this challenge on Goodreads and you can sign up here. 6. I'm going to have one link for signing up, one link for completed reviews and one link for your wrap up posts. I won't be having a monthly link, just one for all reviews read for this challenge. Line #2: Link to your sign up post (please post the direct link to your sign up post, not to your blog's homepage). Yvonne, I hope to read some cozies this year! But I doubt I'd be able to read 10. I'm in! Thanks for the option as to whether to read sub-genres or not. I found that I didn't read as many cozies this year as last year, so I'm happy with the "any cozy" option! Like Suko, 10 will probably be a stretch for me but we'll see! I'll try level 2 - and while I'll try for the genre prompts -I'll probably not hit them all. I am going to do Level 4B and books crossing over to my Cravings for Cozies Challenge.. I'm in. Going for Level 4A.